The next regular meeting of the New London Green Party will be held on Sunday, May 5, 7:00pm, at 19 Evergreen Avenue. We are continuing to plan activities and events for spring and summer, and for the 2019 municipal elections. Anyone who is interested in the New London Green Party and would like to get involved in our our upcoming projects is welcome to join us. A Special Election was held on Tuesday, February 26, to fill the 39th district seat, Connecticut House of Representatives, that was vacated by Chris Soto, who has joined Gov. Lamont's administration as Legislative Affairs Director. Our thanks to each and every person who worked to connect this campaign with the people of New London. Although Mirna did not win the seat, her showing was impressive in a district where the Democratic candidate typically receives 70-85% of the vote, and her campaign inspired New Londoners across the political spectrum as well as Greens throughout the country. From Mirna: "This is not about a single election, but rather a movement towards a better future for ourselves, our children, and our neighbors. I look forward to continuing that movement with you tomorrow." At the New London Green Party's Special Meeting on Sunday, January 20, Mirna Martinez was endorsed to run for 39th district State Representative in the upcoming special election. Mirna is currently serving her third term on the New London Board of Education and was the board president last year. Her campaign committee, Mirna for 39th, is participating in Connecticut's Citizens Election Program (CEP), for which it qualified by receiving more than $3,800 in small ($5-250) contributions that include donations from about 120 New London residents. The campaign's petitioning effort resulted in more than 66 valid signatures, which qualified the campaign for a 2/3 grant of $14,075. We can continue to accept small donations online or by check using this form. Contact us if you'd like to help distribute materials or help with phone-banking in the last week before the Special Election on Tuesday, February 26. Congratulations to Mirna Martínez, who was elected President of the New London Board of Education at its swearing-in and organizational meeting on December 4, 2017. Other officers are Manuel Rivera, Vice President, and Regina Mosley, Secretary, both Democrats. 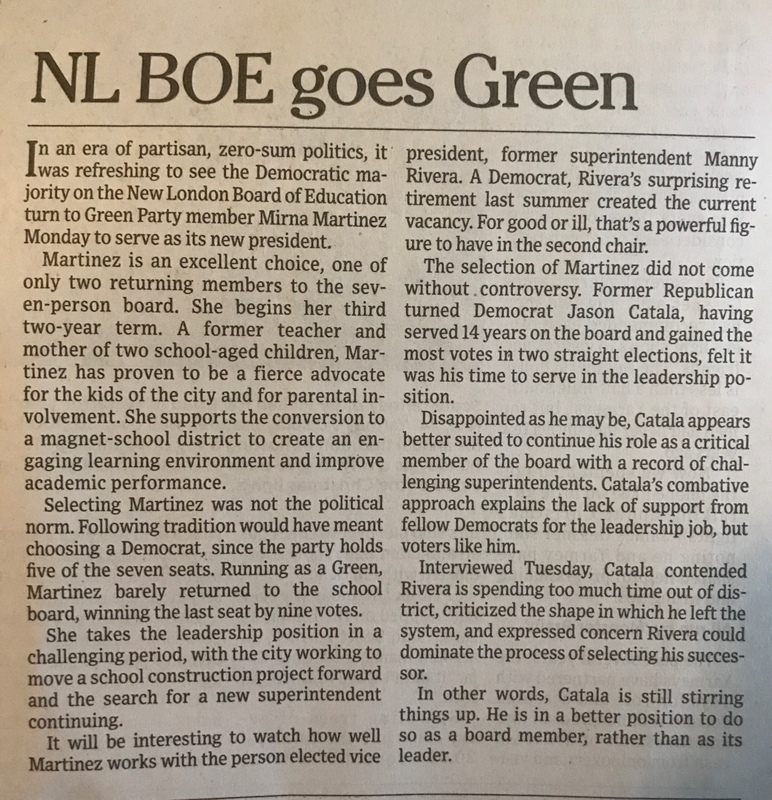 For the first time in New London's history, a Green Party member was chosen as board president. In addition to officers Rivera and Mosley, Democrats Jefferey Hart, Rebecca Amanti, and Jason Catala, as well as Republican Susan Tierney, serve on the current board. Board of Education meetings will be held on the second and fourth Thursdays of each month. The public is welcome to attend!